A better deal is the red "Fast Action Dune Buggy" at $9.99. Another accessory that probably added a few dollars to the cost of a Tonka was a canvas soft top, with clear plastic windows. It didn't fit very well or look very good, and in most cases was probably soon lost. See also a front view photo with the soft top folded (210K JPEG). This example of the steel and plastic CJ-5 has removable tires. The yellow Jeep carrying a canoe, and including a figure in the driver's seat, is from Bob Keniston's collection. 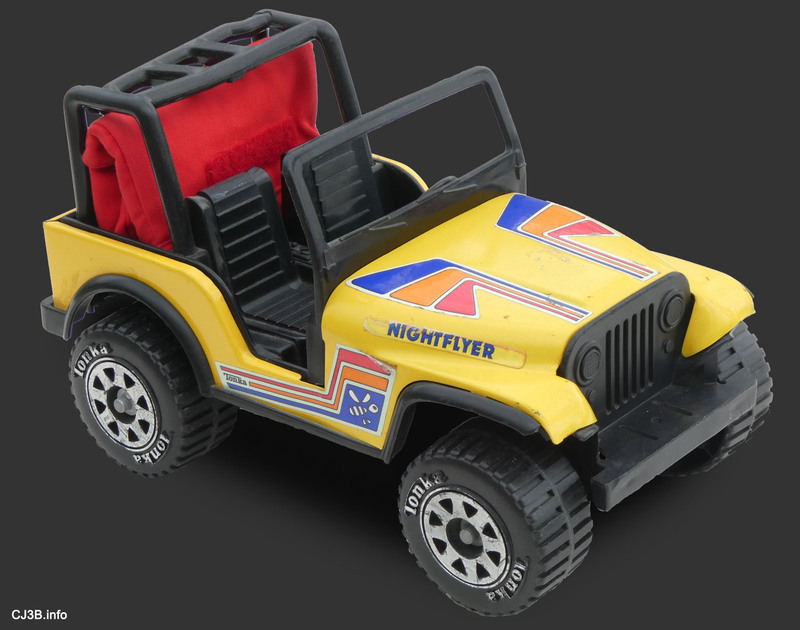 With great graphics and the removable tires, this variation has to rank as one of the nicest toy Jeeps in Tonka's long history. Another one with removable tires belongs to Mike Boyink, who says, "I picked it up for $8 at a toy show. It came with a flatbed trailer. I always figured it was missing whatever was on the trailer, but I found that the Jeep fits on the trailer perfectly. I can only assume that there was some connection between the BFG sponsorship, and the Tonka's removeable tires. Possibly this was a toy sold in BFG retail outlets?" 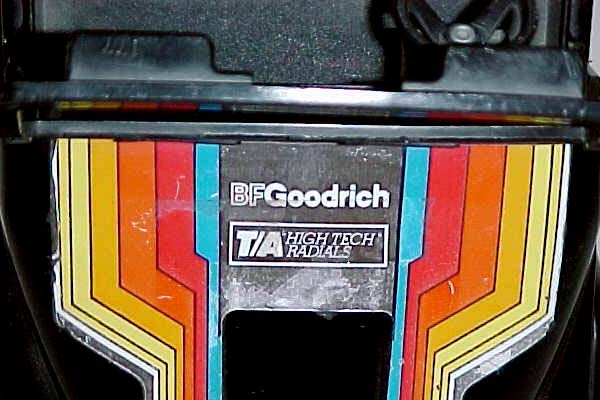 See also a close photo of a removable tire (40K JPEG) and a close photo of the "T/A High Tech Radials" hood graphics (40K JPEG). Bob Keniston sent a photo of the complete BF Goodrich T/A Radials set (100K JPEG). There were a few different versions of the CJ-5 with the large Dune Buggy tires. This one, marked © 1981, is battery-powered, with a large stickshift attached at the back for switching between three speeds, forward and reverse. It's usually seen in this orangeish yellow color, darker than the traditional Tonka construction yellow. 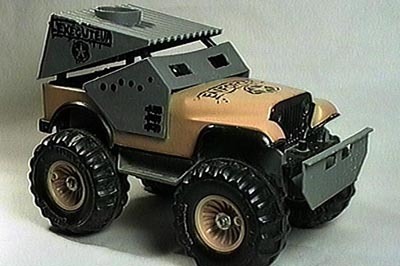 Although the steel body and plastic windshield are the same as on the standard version of this toy (35K JPEG), the plastic base and interior have been changed to accommodate three D-cell batteries in the center, and the motor in the rear. The axles are longer than normal, to allow the large tires to clear the fender flares. 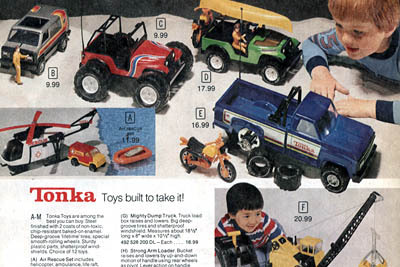 The tires, marked "Tonka AT-857", are soft rubber to provide traction. Bob Keniston has a number of other CJ-5 monsters (200K JPEG) in his World's Biggest Tonka Jeep Collection. The "Enforcer" on the other hand, has hard plastic tires marked only as "Tonka". They are mounted on standard-length axles: fender clearance is provided by a new plastic base which raises the body about 1-1/2" (4 cm. ), and which has leaf springs and 4WD drivetrain molded in. 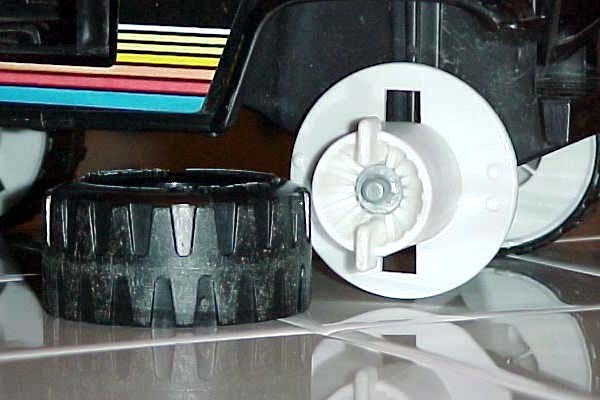 The interior is the same as the standard version, but is covered by snap-on plastic armor. 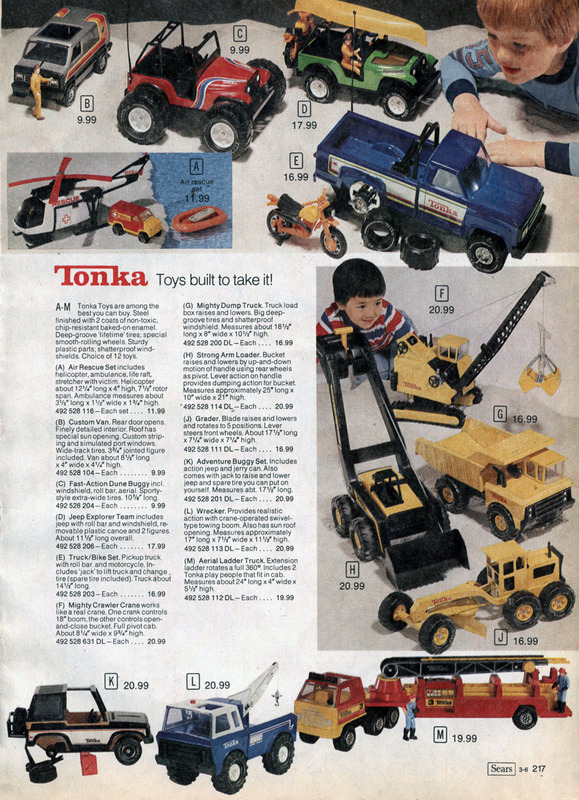 Tonka's Jeepster debuted in the 1969 catalogue, and was produced into the mid-1970's. It is seen with wheels in either the old Tonka style or the newer style (as in the photo). 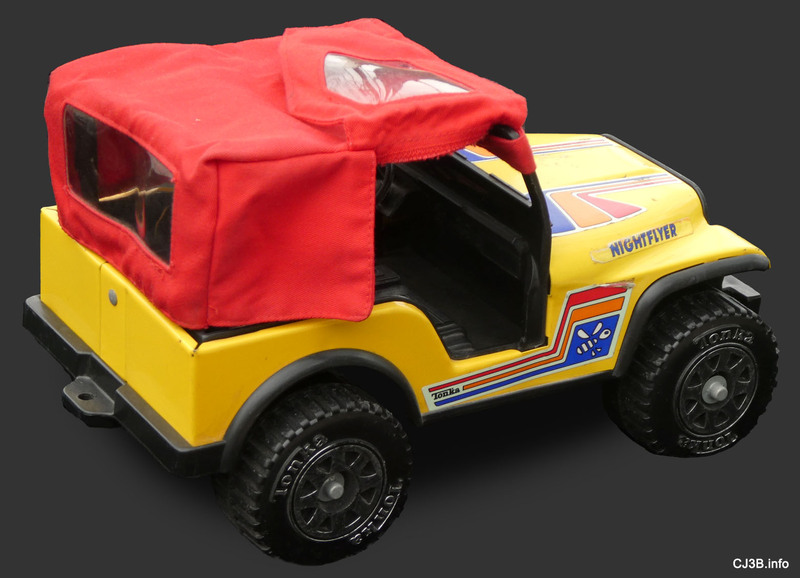 Based on the 1967-73 Jeepster Commando, it's about 12" long and comes in various colors. The front bumper has a raised "JEEPSTER" stamping. Jarek Skonieczny found the "Stump Jumper" version of the Jeepster, with large slip-off wheels as on the BF Goodrich CJ-5 above, but with endcaps on the axles preventing removal of the wheels. See a top view (50K JPEG) courtesy of Lynn Baker. 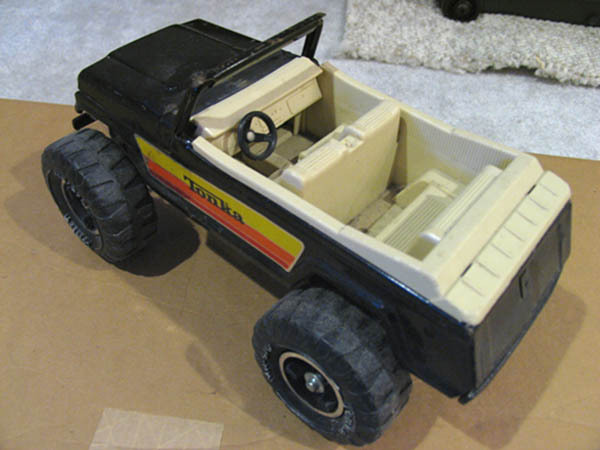 Other versions of the Tonka Jeepster came with plastic full-length or half-length convertible tops (80K JPEG). 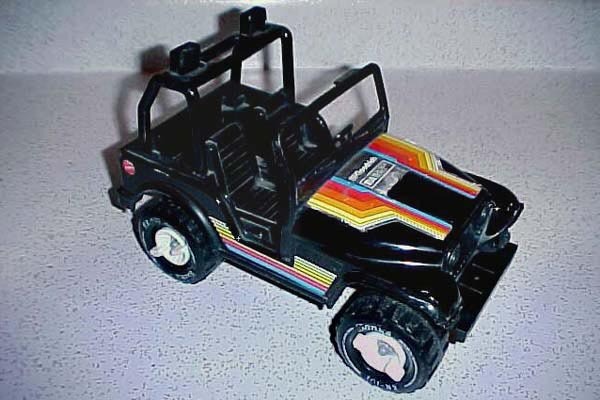 They were also sold as "Jeepster Runabout" sets with a boat and trailer (100K JPEG). Photos courtesy Bob Keniston. This Jeepster Convertible was restored and customized by Bob Wilkins of Vaughn, WA, with accurate miniature Jeep hubcaps. See also a rear view photo (35K JPEG). 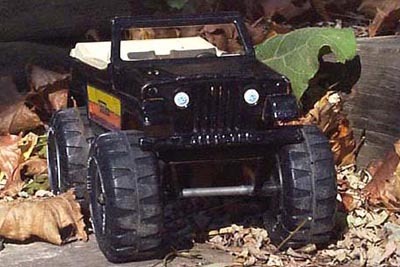 See the 1993 Jurassic Park Tonka YJ on the Jeep in Play Sets page.